Here’s an artist that’s been holding it down for time, practicing the real definition of an M.C. We caught up with him to find out about his new album and mix CD plus tons more. Check it out! How do you describe yourself as an artist? Most readers will think of you as ‘that DnB guy’. Yeah, well it’s fair for people to say that, and I don’t mind that. DnB has taken me all over the world and I’m still proud to represent that, but I’ve done so many other projects with people like Skitz, Fusion, Nextmen etc, that people should tell that I’m more than a one lane MC. So, as an MC, without preceeding it with jungle or hiphop. Just a credible MC, or as an artist. What music got you really hooked back in the day? I grew up listening to soul and reagge. I got into hiphop early, rave then jungle. Who were your major influences or role models? In the early days I liked Public Enemy, NWA, Big Dadddy Kane, Ninjaman and Shabba Ranks. People with style, charisma, big persona’s and a message. When did you step up from being a fan to creating music yourself? Kinda accidently. I always wanted to be a DJ, but couldn’t afford the decks, so got pushed into mc’ing after my friend got some. Did one tape, people heard it and asked when I was doing another… the rest is history. For those that don’t know, what’s the main run down of releases you’ve put out or been on? I can email you a discography for this one. Too long to type. No ego talk! What was your debut ‘World Of Dynamite’ like and how was it received? It was set up like a club, split into three rooms… Hiphop / (breaks:garage) / DnB, so the first few tracks were hiphop and so on, so on. It had a really good response from journalists. I think it was a new concept that people found refreshing. I’m not gonna pretend the sales bought me a Phantom! ‘cause it did what it did, but it represented me at the time, what I was trying to achieve, and I’m proud of it . I saw you perform at KungFu and I’ve seen the energy of DnB. Is it a walk in the park doing hiphop sets? No, not by long shot. DnB is music based. The sound should do most of the work. When I MC on that, I try to enhance without overkilling, but with hiphop, the beat is important yes, but people really wanna hear what you have to say, so it’s time to sharpen your lyrics. No disrespect to any DnB MC, but DnB allows you to talk about the crowd and the bass for half an hour. Hiphop ain’t tryin’ to hear that! How similar do you find the hiphop and DnB worlds? I think they do, and they are. It’s MC’s and DJ’s with different styles, but fundamentally it’s still the same thing. Are you into the more recent styles of rap music like grime? Will we hear you doing some of that? Man… I got enough on my plate with DnB, hiphop and all the other bits I do in between. I like some grime and definetly repect it. Right now, certain mans got it locked, so more power. I’m just pleased so many UK heads are getting together and making the variety of sound from our island, a force to be reckoned with worldwide. What direction has the new album ‘Styles Galore’ taken? Really grooming my hiphop skills. Some stories, some conscious, some funny, some rowdy. Like I said before, hiphop is the platform for expression and I got so many things I wanna say and talk about, so it’s styles galore in the sense of sound, speed, topic and delivery. Can you let us in on some of the producers and guest spots you’ve got on there? Yeah. So far I got Timbaland, Just Blaze, Neptunes, Kanye… Yeah right! I messing with my UK people, still sorting that out. 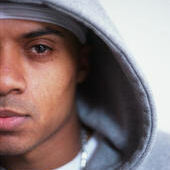 Roni Size done suttin’, First Man done suttin’, Baby J done suttin’ , Plus 1 (Scratch Perverts) done suttin’. I done a few myself. It’s still building. You produce beats yourself? How do you find that? Yes I do, and I love it. Any MC who’s ever made his own beat then spat on it knows what I mean. I’m not saying I’m a great producer but I’m learning and there’s nothing better then building exactly what you wanna hear in your head, then riding it. I’m workin’ with a singer too. I plan to get behind the boards more. What label are you signed with for the album? I have my own label, ‘Strong Records’ and that’s the outlet at the moment. Any changes, I’ll keep you posted. I heard someone say that there’s also a mix CD on the horizon. What can we look forward to on there? Mix CD’s hitting stores right now. It’s called ‘Big Man Talk’, not in an ego way, just in a ‘I’ve been in the game a long time’ way and am touching some different subjects on there. Tracks like ‘Marcus Garvey’, ‘Life Is So Crazy’. There’s a lot of unneccessary badness out there. Education should never be overlooked, but don’t get it twisted. It’s not a preachy preachy. There’s party, rowdy, bashy on there… Dynamite Style! How did your new Kiss 100 show come about and what sort of music can we expect from it? Yep, I’m on Kiss 100, monday nights 9-11. I play hiphop / RnB / reggae. Been on the edge of having a radio show for a while. It just happened that Kiss were interested so I stepped up. I’ve had a few guests on there so far like Sway, Estelle, Teri Walker, Baby J , Killa Kella, Erick Serman & Camilla, so it’s going good. I play UK and US artists. I wanna help heads blow as well as myself. I’m not greedy. What’s the hottest artists and tracks you’ve heard lately that we should all go check out? Check out Nemesis, check out Malika Faye, TB, Broken English, Blaq I. The new Kyza tune’s sick! New Mobb Deep, Murs. There’s things out there. We grow stronger! Have you got any plugs or shout out’s you wanna drop? Shout to everyone supporting what we do and what I do. Support the industry and it’ll support you back. Bless. Dyna Dyna. Check out Dnya’s Myspace page as well as his new Kiss 100 show’s website. Go grab ‘Big Man Talk’ on Strong Records and check out ‘Styles Galore’ when it drops. Dynamite MC features on the forthcoming Rapnews Podcast 2.